Short cozy reads, but great mysteries! Francesca Amaro can’t help getting into the middle of another murder when she figures out it was murder and everyone else thought it was suicide. How would go shopping right before committing suicide. 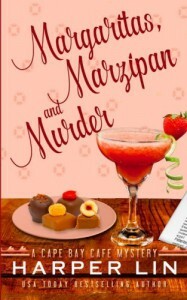 After a night out with the girls it ends up in finding a dead body in the alley behind Mary Ellen’s Souvenir shop and she finds out later that the man bought gifts from there and that he also bought some marzipan. Francesca knows for sure you don’t by candy if your not meaning to eat it so with the help of her boyfriend she does a little sleuthing even though the police detective wants her to stay out of it. Mike also knows that she is a good sleuth and so it’s hard to get to made when she helps him solve the case. I like Francesca she seems like a lot of fun. She works hard making good coffee and even learned how to make good tea (previous book) and she loves her little shop. It has a lot of good secondary characters and I like her boyfriend Matt. The mystery was really good too which I think is good since it was a short listen. I have really enjoyed listening to this series and short books are nice in between long ones. And who doesn’t like a coffee theme!! I think any cozy reader would enjoy this series. This one is book three.